I had my pick of anything I wanted to eat for dinner and of course, I went with pizza. J was going out to dinner with some of her friends at Old Burdick’s downtown. Since parking can be kind of tough in that part of downtown, I decided to take her drop her off. Since I was heading downtown, I called in an order to a pizza place that I still haven’t been able to check out. Papa Pete’s is on South Burdick Street in the same building as The Blue Dolphin. The entrance to Papa Pete’s is actually on Cedar Street. There’s a blue awning with a few letters missing, but you get the idea. 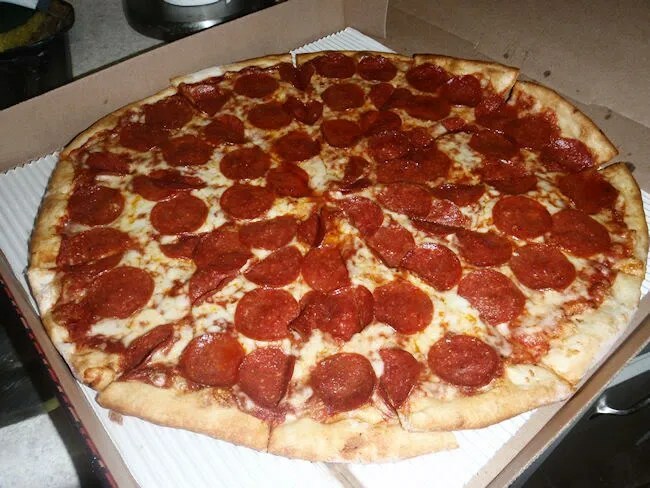 Around 6:00, I called in my order for a 16″ pepperoni pizza. The guy on the other end said it would be fifteen minutes so we went there to pick up the pizza before I dropped J off at Burdick’s at 6:30. 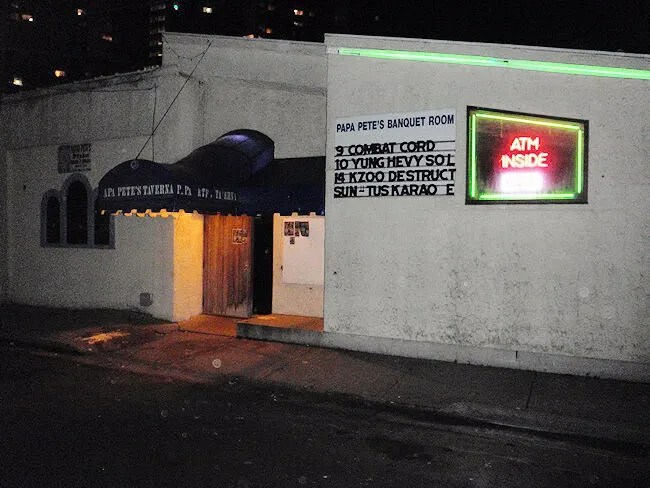 Papa Pete’s is a pretty typical dive bar. Being a Monday night, there weren’t a lot of people in the joint, but there were a few drinking cheap beer and playing pool. In the back of the space is a large stage and open area. 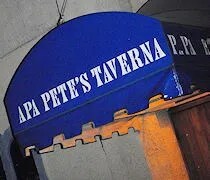 I’ve heard there have been some pretty wicked concerts, but the bands that play Papa Pete’s aren’t really my thing. I went straight to the bar where the bartender asked me I had a pizza. I said yes and she grabbed the only ticket next to her cash register. To my surprise, the pizza was under $8. At that point, I was wondering if I had ordered the right size because eight bucks seemed really cheap. After paying cash for the pizza, the bartender headed back to the kitchen to pick up the box. I was happy to see a large box containing the 16 inch pizza I thought I had ordered come out and make it’s way towards me. After dropping J off and picking up a bottle of Pepsi from a gas station on the way home, I cracked open the box. What I found was a pizza with a crust slightly thinner than the typical delivery pizza. It was soft and chewy and easier to eat “New York Style” by folding it over on itself. The top was a little greasy from the cheese and the pepperoni, but that grease gave the whole pizza a slightly spicy kick to it. 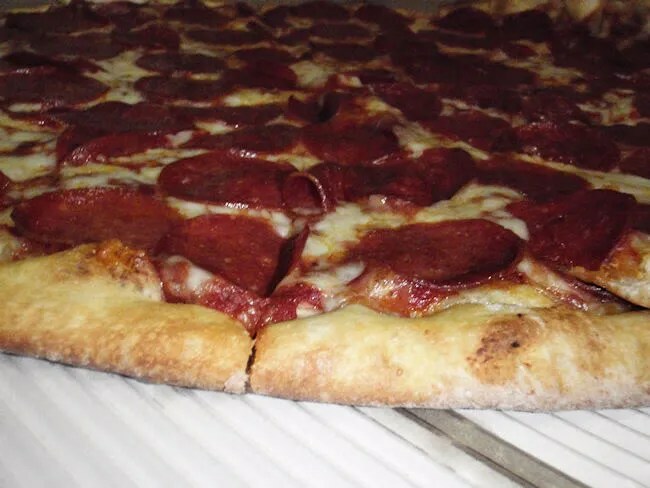 The sauce didn’t really stick out because what I could really taste was the pepperoni and I really liked it. Papa Pete’s was actually pretty good. This was the second time I had tried to order from them. The first time, they were having phone problems or something and J couldn’t understand the person on the other end, so she just hung up and we ordered from somewhere else. This time, it worked out pretty good with me having to drop J off downtown. At less than eight bucks for a huge 16 inch pizza, I would definitely call it the best value in town.